The Car Division of the Bristol Aeroplane company was formed in 1945 after a link up with the company AFN (Archie Frazer Nash) who were before the war, the importers of BMW cars. It was mainly due to the determination of George White, the grandson of the aircraft company's founder that this took place. His vision was to produce high quality cars, built to the demanding standards employed in the aircraft industry. 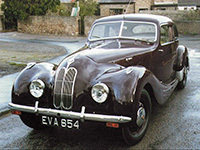 Bristol Cars launched its first motorcar, the Bristol 400 2-litre saloon in 1947. It was shown at the Geneva Motor show in March of that year shortly after the link up with AFN dissolved. It had definite styling similarities to the pre war BMW 328 to which Bristol held the rights, and the 6-cylinder engine was a much modified and re-engineered version of the BMW unit. This engine was to power many more Bristol models throughout the 1950's and was very popular, with Bristol supplying them to many other British manufacturers for use in their cars, including AC and Lotus. Bristol used the 6-cylinder engine in all their own cars up until 1961. All later Bristol models were fitted with an American Chrysler V8 engine in varying capacities. In 1956 the Bristol Car Division became a separate subsidiary of the Bristol Aeroplane Company. It was in 1960 that George White and former Grand Prix racing driver Anthony Crook acquired the Company, which then became Bristol Cars Ltd, and in 1966, they formed a partnership. Throughout the following decades, Bristol continued to set new benchmarks in performance and luxury, with the cars still being built to the exacting standards that had first been envisaged by George White in 1945. In 1973, when the now Sir George White retired, Anthony Crook became the sole owner, and Bristol reverted to being a Limited Company. Bristol continues to produce high quality cars to this day, and a new model - the "Fighter" Is soon to be launched with an anticipated price tag of £175,000. The Bristol 400, a sporting 4-seater saloon, was the car that launched the Bristol marque. It went into full production late in 1946 after being unveiled to the press a few months earlier. The Bristol 401 2-litre saloon was introduced in 1948 and was the second car produced by the still very new company. The main difference between this car and the earlier 400 was that the body panels were now all aluminium and were fitted to a tubular steel framework that was attached to the steel box section chassis.